The Astro Global Network project allows observatories and astronomers from all over the world to record their setup, observation site and activity type in a world astronomer registry. The register will allow to perform shared activities, both observational and photographic, such as alerting astronomical events to the network where other astronomers can collect reports, or share raw, avi, photographic planetary and deep sky to make shared photographic achievements. 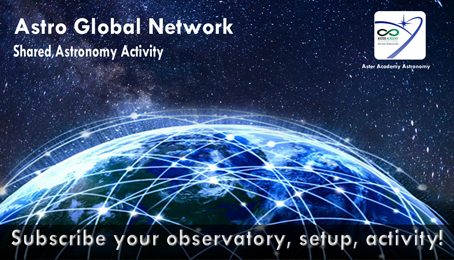 Each member of the network can propose shared astronomical projects or report astronomical events and phenomena.